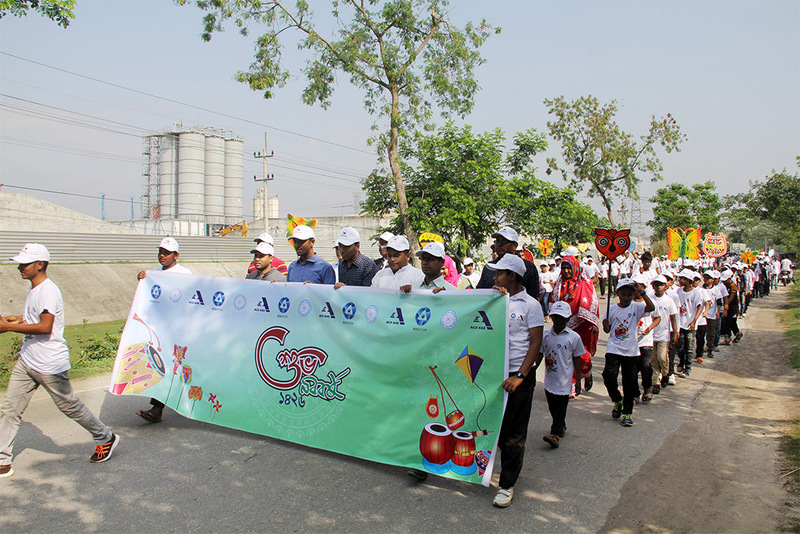 In observance of Pohela Boishakh, the first day of Bangladesh New Year- 1426, Bangladesh Atomic Energy Commission (BAEC), Rosatom State Corporation of Russia and its Engineering Division – ASE, General Contractor of Rooppur Nuclear Power Project (Rooppur NPP) jointly organized a colorful rally at Rooppur of Ishwardi on April 14. Over three hundred students, teachers, officials from the organizing companies took part in the rally, which started in the morning from Rooppur High School play ground and went around various roads of Rooppur. The participants wearing T-shirts with Noboborsho wishes carried various Noboborsho themed placards and performed songs welcoming the Bangla news year. Besides, colorful banners with Noboborsho wishes were placed at different important places of Rooppur and Ishwardi. The Bangla Noboborsho celebration was a part of Bangladesh- Russia joint communication program on nuclear energy, which includes observance of selected national festivals of Bangladesh. The Rooppur Nuclear Power Plant is being implemented with the technical and financial supports from Russia. The plant will have two units, each of 1,200 MW capacities. Latest generation 3+ Russian VVER-1200 reactors, which fully comply with all international safety requirements, have been chosen for the plant. The work of the project is progress as per schedule and first unit is expected to be commissioned in 2023.